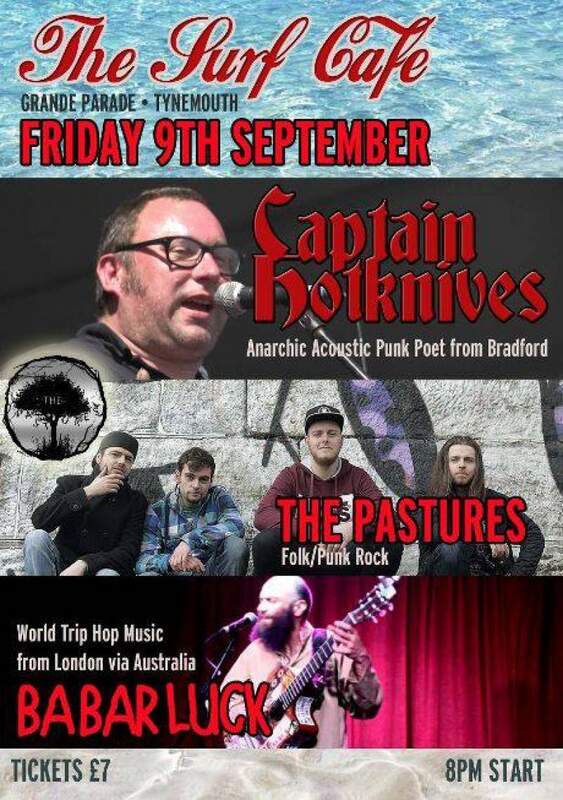 Following a Summer of festival appearances such as Glastonbury, Beatherder, Shambala and Boomtown, Bradford comedian and acoustic anarchic punk poet Captain Hotknives is set for a fun North East appearance at Surf Cafe in Tynemouth on Friday 9th September. Telling tales of How Johnny Depp Stole His Bird, The Pigeons Told Him To Shoplift and How To Skank Your Nana, it’s going to be an evening of laughs and song. Support from high energy folk punk rock band The Pastures and the extremely talented, musical philosopher Babar Luck, the ex King Prawn bassist opens what is sure to be an incredible show, and a Friday night you won’t forget in a hurry. Captain Hotknives plays Surf Cafe, Tynemouth on Friday 9th September.